I have recently been running a POC of Hyper-V 2012 R2 experimenting replicating several VM’s to Windows Azure (Site Replication) in the East Asia region. During the POC I was receiving connection issues from the Hyper-V host so I decided to remove the Azure Site Recovery Provider agent from the Hyper-V host and the configuration settings from within Azure so that I could start again. Upon going through various troubleshooting steps I found that the uninstall had not completely removed the previous registry settings for the site replication vault which was causing me the problem. 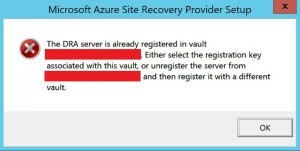 1) Uninstall the existing Azure Site Recovery Provider from your system. This time the registration worked and my Hyper-V host appeared as a registered server within Azure. At last I can carry on with the setup :-).